***WHOLESALE PRICE*** ***WHOLESALE PRICE*** FINANCING AVAILABLE WE FINANCE EVERYONE REGARDLESS OF CREDIT!! GUARANTEED CREDIT APPROVAL!! HABLAMOS ESPANOL!! ACEPTAMOS ITIN, MATRICULAS O PASAPORTES!! Hablamos espanol. 2011 TOYOTA RAV4 LIMITED 2WD. CARFAX CLEAN VEHICLE. REAR VIEW CAMERA, LEATHER SEATS, JBL RADIO SYSTEM, WHITE EXTERIOR COLOR. This vehicle is equipped with a 3.5 L V6 DOHC 24V 6 cyl engine, four speed automatic transmission, ABS brakes with traction control system, tilt steering wheel, active belts, full airbag system, CD/AM/FM stereo system, A/C Cold, beautifully kept. It drives and runs perfect. Oil service has been performed, new filters. See more pictures at www.brogsauto.com Call us at 972-243-7465 today to schedule your test drive. Available 4 years/unlimited miles extended warranty available!!! 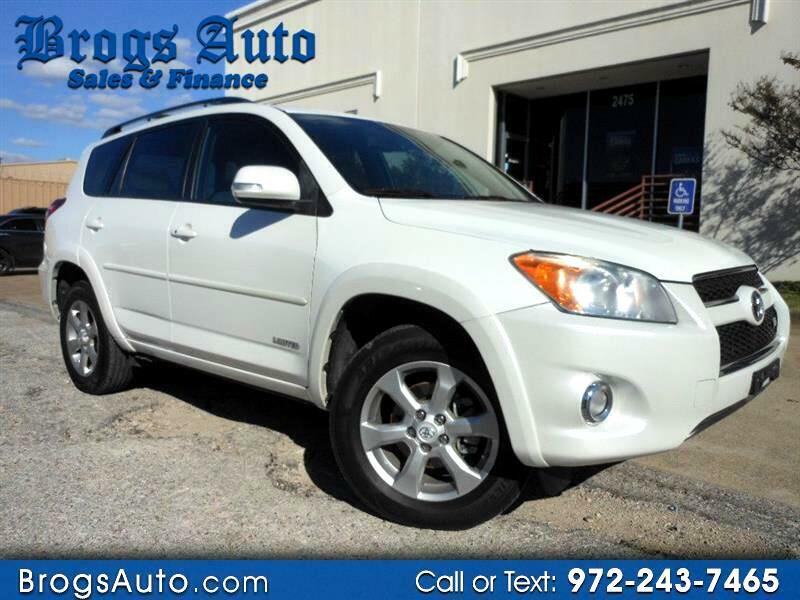 Visit Brogs Auto online at www.brogsauto.com to see more pictures of this vehicle or call us at 972-243-7465 or at today to schedule your test drive. ALL SALES ARE FINAL. WE RESERVE THE RIGHT TO SELL TO ANYONE. There is no right of purchase, all sales are first come-first serve. Deposits on vehicles are suggested, there is no obligation to put a deposit on any vehicle. All deposits are Non-Refundable. Some of the units for sale have an extended powertrain service contract of 5000 miles or 90 days included in the price of the vehicle, please contact a sales representative for more details. Please confirm the accuracy of the included advertised equipment of this vehicle. While we make every reasonable effort to ensure the accuracy of this information, it is recommended to verify any information in question with your Brogs Auto sales advisor. DEALER makes no representations, expressed or implied, to any actual or prospective purchaser or owner of this vehicle as to the existence, ownership, accuracy, description or condition of the listed vehicle's equipment, accessories, price, specials or any warranties. Any and all differences must be addressed by the buyer prior to the purchase of this vehicle. Any used vehicle may have normal wear and tear. i.e. minor dings/scratches/chips/etc. is the entire responsibility of the buyer to inspect the vehicle thoroughly before its purchase. All vehicles are sold as-is from the dealer unless specified on the website, some vehicles may still have factory warranty remaining. All advertised prices are cash only and do not include government fees, taxes, finance charges, bank fees, financing fees or cost of credit, dealer document preparation charge and any emission testing charge, License, Title, Registration Fees, State or Local Taxes, Dealer Prep, Smog Fees, Credit Investigation, Optional Credit Insurance, Physical Damage of Liability Insurance or Delivery Fees. Dealer's portion of vehicle service contracts and GAP are non-refundable. Guaranteed credit approval is based on risk, down payment and a minimum monthly income of $1,474. Please call sales or finance team at 972-243-7465 for more information.